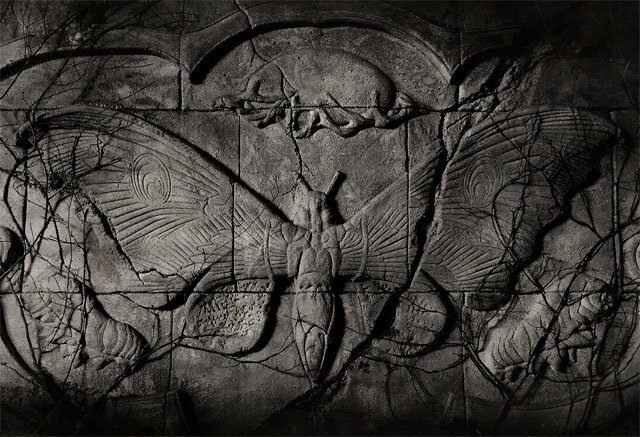 In the wake of Kong: Skull Island‘s release on Blu-ray last week, Warner Bros. Pictures and Legendary Pictures‘ upcoming sequel Godzilla: King of the Monsters is already getting a viral push with a new Mothra image released on the mysterious Monarch Sciences Twitter page reading, “Unlocked: Monarch Classified File #63061 – Temple of the Moth, Yucca Province – E. Russell #MonarchSighting.” Check out the full image in the gallery below! The next chapter in Legendary’s cinematic MonsterVerse was teased in the end credits tag for Kong: Skull Island, where Tom Hiddleston’s James Conrad and Brie Larson’s Mason Weaver were given a slideshow by Monarch scientist Houston Brooks (Corey Hawkins) showing cave paintings depicting Mothra, Rodan and Ghidorah in battle. Click here to purchase the new Kong: Skull Island Blu-ray! Directed by Michael Dougherty (Trick ‘r Treat, Krampus), Godzilla: King of the Monsters stars Oscar nominees Vera Farmiga (Up in the Air, The Conjuring films), and Ken Watanabe (The Last Samurai) and Sally Hawkins (Blue Jasmine), both reprising their Godzilla roles, Kyle Chandler (The Wolf of Wall Street, Manchester by the Sea), Millie Bobby Brown (Stranger Things) in her feature film debut, Bradley Whitford (Get Out), Thomas Middleditch (Silicon Valley), Charles Dance (Game of Thrones), O’Shea Jackson Jr. (Straight Outta Compton), Aisha Hinds (Star Trek Into Darkness), and Golden Globe nominee Zhang Ziyi (Memoirs of a Geisha, Crouching Tiger, Hidden Dragon). Filming is taking place mainly in Atlanta, Georgia. A presentation of Warner Bros. Pictures and Legendary Pictures, Godzilla: King of the Monsters is currently scheduled for release in March 2019, and will be distributed in 3D and 2D and in select IMAX theaters by Warner Bros. Pictures, a Warner Bros. Entertainment Company, except in Japan, where it will be distributed by Toho Co., Ltd.